Mexican police say they have killed 19 gunmen in a shootout in the northern state of Sinaloa. Five police officers were injured in the confrontation. It started on Friday night in the town of Villa Union and ended after a multiple car chase in Aguaje, a few kilometres away - both in Mazatlán. The region has seen fierce in-fighting in the powerful Sinaloa drugs cartel since the arrest of its leader, Joaquín "El Chapo" Guzmán, last year. 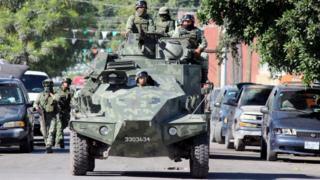 This was one of the worst clashes in the south of Sinaloa in recent months, local media reported. The gunmen had just killed two men from a rival gang when they were surprised by a large contingent of police who happened to be in the neighbourhood. They alerted army troops in the area, who chased the alleged gang members and caught up with them in Aguaje de Costilla. The security forces seized some 20 weapons and three pick-up trucks from the gang. Violence in the region has gone up by 76% in the first five months of the year compared with the same period in 2016, according to the Home Office. Guzmán was arrested in January 2016, six months after escaping through a tunnel from the high-security Altiplano penitentiary near the capital, Mexico City. He was extradited to the United States a year later to face drug trafficking and money laundering charges. Guzmán - whose nickname means "Shorty" - is believed to have amassed a billion-dollar fortune through the drugs trade after setting up the Sinaloa Cartel in the late 1980s. In May, award-winning journalist Javier Valdez became a high-profile victim of the violence in Sinaloa. Mr Valdez was acclaimed for reporting on the drugs trade in Sinaloa and the involvement of politicians and police. He was killed in the state capital, Culiacán, where he lived and worked. His death prompted protests in many Mexican cities.